11 feet of 5/16" I.D. (9/16" O.D.) 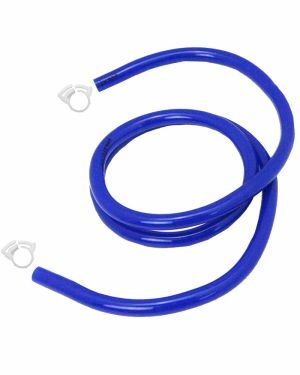 Blue Air/Co2 Tubing made of Thermoplastic Vinyl Hose (Super Vinyl). This tubing will not rot, swell or dry out and is unaffected by normal cleaning compounds. This air line assembly comes with two Plastic Snap Clamps with a reusable clamp design. Reusable plastic clamps make it easier to switch out taps or for cleaning. Additional custom lengths are available.